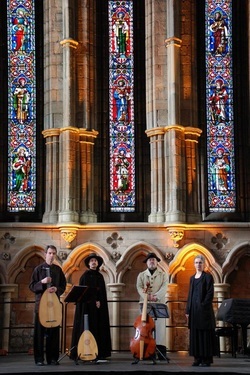 The art of 'dividing' upon a ground bass, or playing 'divisions', was the equivalent of our modern jazz tradition in the Elizabethan period and throughout the seventeenth century in England. Skilled musicians, both amateur and professional, would improvise upon a fixed repeated harmonic sequence (the 'ground'), often with astonishing inventiveness and virtuosity. This programme explores some of the many composed, and therefore surviving, examples of this art along with sets of variations on popular tunes of the day. Lute solos alongside divisions played on treble, tenor and bass viols accompanied by lute improvisations make for a rich palette of aural colours and a vibrant and virtuosic recreation of sixteenth and seventeenth century music making in England. _ At the turn of the 17th century the lute was the undisputed king of instruments, and John Dowland its greatest English champion, until gentleman-composer and soldier Captain Tobias Hume threw down the gauntlet and claimed the viol to be its equal. The Lion and the Unicorn explores the tussle for pre-eminence between the two instruments through the words and music of Dowland, who challenged Hume's assertion, and of Hume himself. Jacob Heringman, lute, and Susanna Pell, viol, are joined by actors Simon Pell and Thomas Frere to bring these colourful and complex personalities to life. The result is a highly entertaining evening, profound, beautiful, and often humorous, containing some of the finest music and poetry of the late Elizabethan and early Jacobean period.